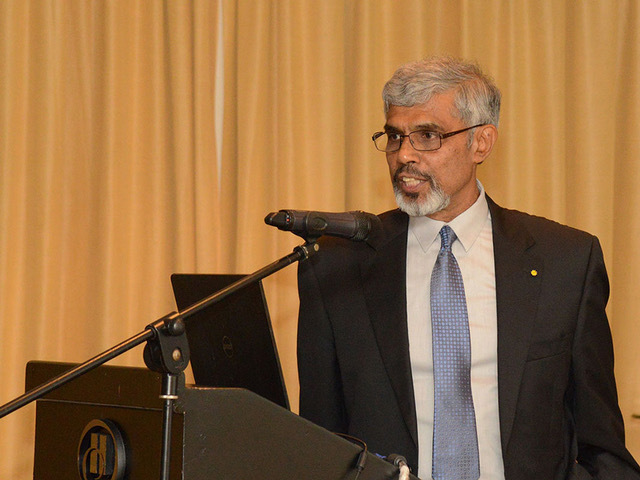 Tissa Illangasekare, AMAX Distinguished Chair of Environmental Sciences and Engineering and professor of civil and environmental engineering at Colorado School of Mines, has been inducted into the National Academy of Sciences of Sri Lanka. NASSL is a high-level, nongovernmental scientific body that provides independent advice to the Sri Lankan government on policy matters related to science and technology and promotes the advancement of scientific knowledge. Admission into the academy is highly selective; scientists who have achieved excellence in their respective scientific or technological fields are nominated by current fellows for consideration. As of 2016, there were about 125 fellows worldwide. Illangasekare, whose primary area of research is the modeling of flow and transport in permeable and fractured media, is director of the Mines Center for Experimental Study of Subsurface Environmental Processes. He joined Mines in 1998. Illangasekare received his PhD in civil engineering from Colorado State University, a master’s degree from the Asian Institute of Technology in Bangkok, Thailand, and a bachelor’s degree from the University of Ceylon in Sri Lanka.